All train services from Norwich are wheelchair accessible. Assistance is also available for those with restricted mobility, sight impairment or anyone who may require extra assistance. You can request assistance either over the phone on 0800 028 2878 (free of charge), Monday to Sunday between 0800-2200 hours. Textphone and Minicom users please prefix 18001 prior to dialing. Email: AbellioGreaterAnglia Assisted Travel or by filling out a form over the Internet. AbellioGreaterAnglia. When you book, you will be told where in the station to find assistance. Someone will then accompany you and help you to your seat. If you are a wheelchair user and travelling to London Liverpool Street, seating is in the first class section, although you pay only the second class fare. Almost all trains, except some short route services, have wheelchair accessible toilets. It is a good idea to ask the guard to call ahead to your destination in order to remind them to have assistance ready when you arrive. Although they should be ready, it is best to make sure. If you are planning to get off at any station that is not a terminus, it is also advisable to speak to the guard and make sure he/she helps you to get off the train at the right station. Disabled Persons Rail Card. If you plan to travel more than once a year, this is a good investment. It costs £20 for one year and £54 for three years and entitles you to 1/3 off most rail fares, both for yourself and a companion. For further information: Visit Disabled Persons Rail Card. Radar Key: Almost all stations have wheelchair accessible toilets and you will need a Radar key to get in. Keys are available from a wide range of suppliers. 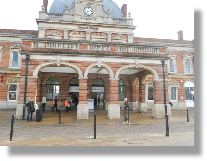 Network Rail have a guide to station facilities including access.